November 2018 - ID Studios, Inc.
ID Studios is growing again! 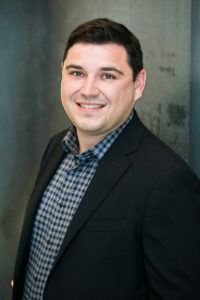 Please welcome our newest Project Manager, Stephen Scirrotto. Stephen joined ID Studios with over 13 years of experience of Architecture, Design and Project Management, he is taking on a role as Project Manager at ID Studios where he will oversee all phases of the design process. Prior to joining, Stephen was an Associate, Architect and Design Manager with Gensler San Diego for over 7 years where he was the Design Resilience Leader for the Workplace Studio, as well as lead the Technology and Financial Services Firm Workplace Practice Areas. Stephen started his career in the Boston area where he worked with Okun and Associates in which his focus was on higher educational projects for Harvard University. Stephen is a licensed architect and holds a Bachelor of Science in Architecture and a Master of Architecture Degree from Roger Williams University. Stephen focuses on understanding client’s needs, which allows him to deliver effective design solutions. He believes that the biggest challenges bring out the best in an architect, as constraints drive creativity. Ultimately, building lasting relationships with clients that come back time and again is deeply satisfying to him. Stephen, along with his wife and two children enjoy spending time together outdoors in nature, at the beach, mountains and desert.